Due to the amount of content it is important that applicants understand the commitment involved. Details are laid out in the prospectus and on the website and we encourage enquiries about all aspects of the course. 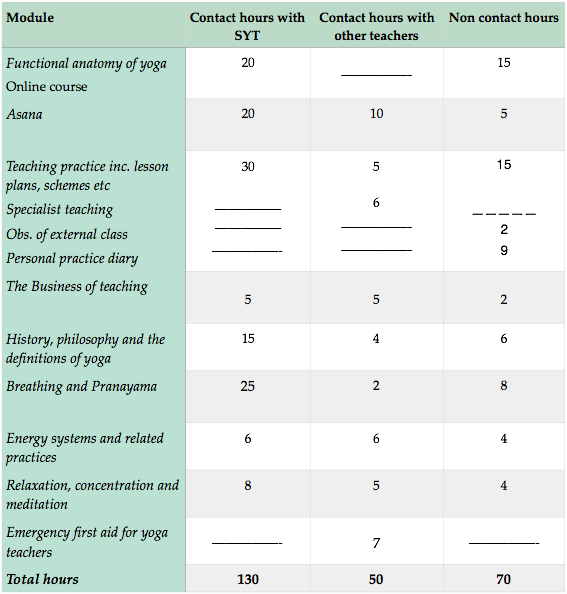 The structure of the course, contact hours, home study and methods of assessment are clearly laid out. From the start we encourage contact between students, students and mentors and course leaders. Progress will be monitored, regular feedback given and timely prompts when deadlines approach. Using various media we want all involved to contribute to the course and to the school. Please note that the distribution of hours may alter closer to the start date. There is an expectation that students will continue with their regular weekly class attendance and take the opportunity to attend workshops, etc. Any events or relevant training should be logged and reflected upon in your practice diary. This will count as part of your assessment. Personal practice hours are in addition to the 250 hours training schedule. We are lucky to have so many experienced teachers and practitioners on the course. Delivery and distribution of hours may change as the school members focus on the fine detail closer to the start.